What do Carlisle and Morecambe line-ups tell us about Sunderland's Checkatrade Trophy chances? Sunderland kicked off their quest for Checkatrade Trophy glory with a penalty shootout win over Stoke City U21s at the Stadium of Light. 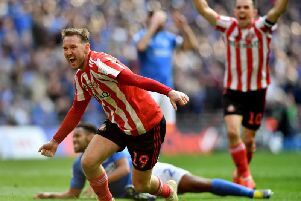 The game finished goalless but Sunderland triumphed on penalties to gain an extra bonus point. Black Cats boss Jack Ross made EIGHT changes to the side that drew 1-1 with Oxford United at the weekend, however their strong line up featured several potential first-team starters. Robin Ruiter, Denver Hume, Ryan James,Tom Flanagan, Dylan McGeouch, Luke O'Nien, Ethan Robson and Charlie Wyke all started and most are expected to play a big part in hopefully leading the club out of League One at the first attempt. Lline-ups in the other Group A tie between Carlisle United and Morecambe presented a total of 11 changes. Carlisle kept relatively the same squad from the side that were defeated 1-0 defeat at Mansfield Town on Saturday with Adam Collin, Macaulay Gillesphey, Tom Parkes, Gary Liddle, Jamie Devitt, George Glendon, Jerry Yates and Richie Bennett all staying put. However, it was a very different picture from Morecambe, who like Sunderland, fielded eight different players from their previous outing at Bury, with only Josef Yarney, Andrew Fleming and Carlos Gomes Mendes surviving. Unfortunately for the Wearsiders, their penalty shootout win over Stoke - which added a bonus point to the point they earned for a draw - wasn't enough to lift them top as Carlisle edged the Shrimps out 3-2 in 90 minutes. But overall, with competition rivals seemingly set to rest key players for their all Checkatrade Trophy games, Ross' men might just fancy their chances in a trip to Wembley Stadium.